Today is sneak peek day #2 of Taylored Expressions November release. yesterday I showcased 2017 calendar using watercolor panels. If you like to see them, click HERE. Today I am showcasing Initially “T” die and Herringbone embossing folder to make monogrammed notecard set. I have made a set of four cards. Two red and two green. 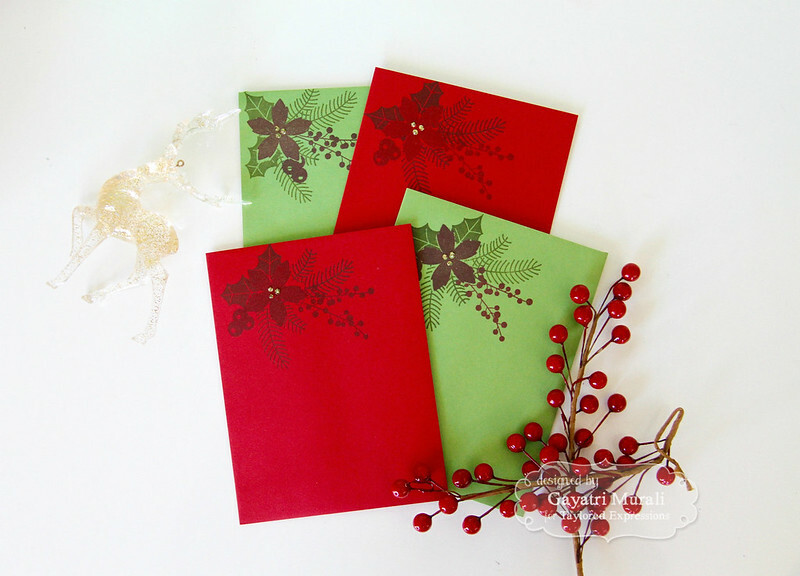 I used the embossing folder on the background for one red and green card respectively. On the other two I embossed the foiled Initially “T” just for a change. I have used Toffee cardstock as the base notecard. Then I die cut two Peapod and Cherry Pop cardstocks using the largest stitched rectangle die from Stitched Rectangle Stacklets. 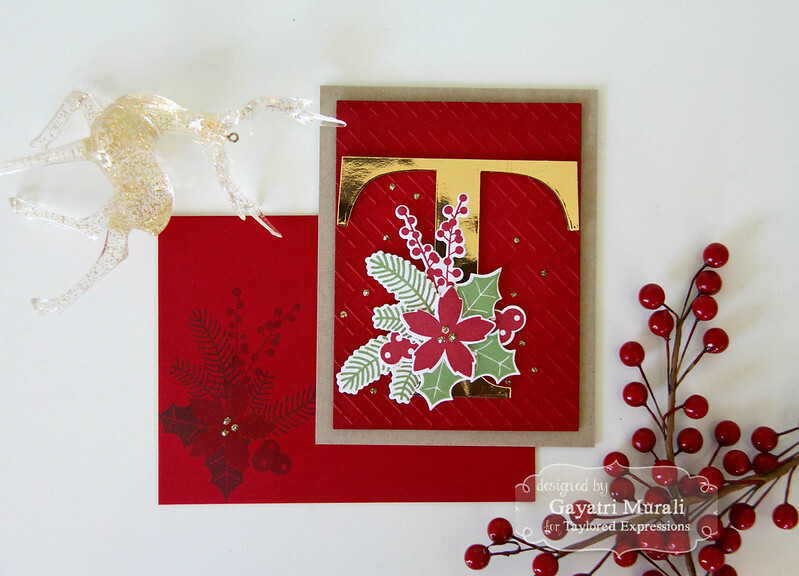 I embossed a red and green panel using the new Herringbone Embossing folder. I adhered all the panels on the card base using foam adhesives. Then I die cut four alphabet T using the new Initially “T” die. I foiled them using the minc machine. Then ran two of them using the Herringbone embossing folder. I adhered all the foiled alphabets on the card front using foam adhesives. 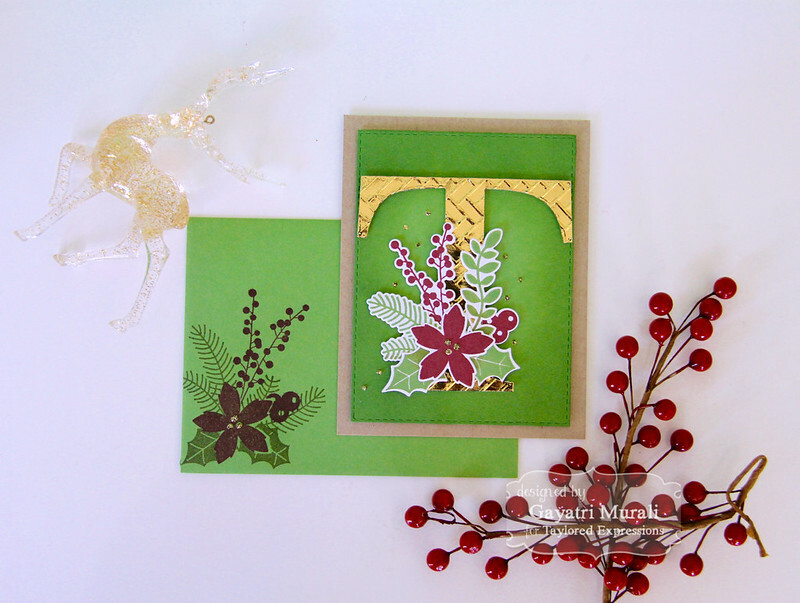 To decorate the alphabets I used Holiday Florals stamp set and coordinating dies. I stamped the images using Mulled Wine, Cherry Pop, Peapod dye inks. Then die cut using the coordinating dies. I clustered them and adhered as shown in the photo. Some of the die cuts are adhered using foam adhesives and some glued flush. I then embellished the card with Nuvo Gold Glitter drops. 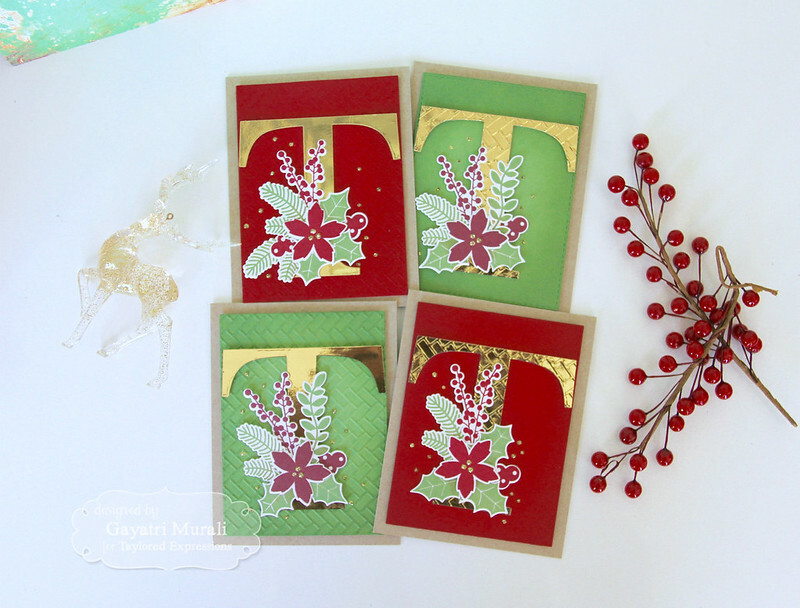 I stamped the coordinating envelopes from TE Multicolor pack with the Holiday Florals images and embellished with the Nuvo Gold Glitter Drops. Here are couple of photos of individual card and coordinating envelope. I have put all the cards and envelopes into a clear card box also available at Taylored Expressions store. Then I used the Noteworthy Belly Band die to decorate the box. I die cut the belly band using red foil cardstock. The sentiment is from Noteworthy stamp set stamped on the centre circle die. This a wonderful thank you gift to give a special person who you appreciate a lot. I know who this one is going to! Hope you like my note card set. All the supplies I used to make this note card set is listed below. I forgot to mention this: Taylored Expressions is running a promotion using the Initially dies. Check it out below. See you tomorrow for day #3 of the sneak peeks. Thanks for stopping by my blog today! What a pretty card set! I like that you did some cards one way and others slightly differently. The colors and shine of the foil are so festive!